Made by Godfrey Phillips (Aust) Pty Ltd in Melbourne, Victoria, Australia, 1932. The “Bodyline” Ashes series between England and Australia in 1932-1933 was one of the most controversial ever held between these two traditional cricket rivals. Cigarette cards, one issued free with each pack bought, were in the 1930s a traditional means of collecting information about your heros. Often special albums were produced to house them. Cigarette collector cards (21), "Test Cricketers 1932-1933", BDV Cigarettes / Godfrey Phillips (Aust) Pty Ltd, Melbourne, Australia, 1932. 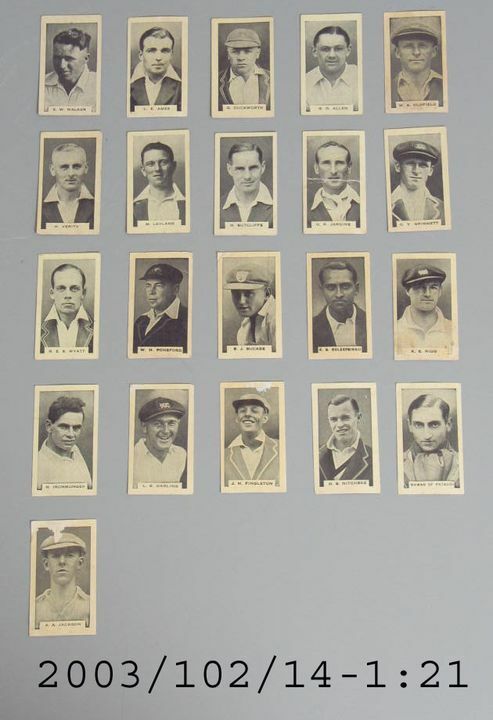 Cigarette cards showing the members of the "Bodyline" Cricket teams of 1932-1933. Each card has a photo and details of each cricketer and is numbered. The number of these cards are from 1 to 36 with numbers 3,5,8,9,12,13,15,16,17,23,24,28,31,33,34, missing. Card 1 shows C.W. Walker, South Australia, Wicket Keeper. Card 2 shows L.E. Ames, Kent, Wicket Keeper. Card 4 shows G. Duckworth, Wicket Keeper. Card 6 shows G.O. Allen, Middlesex, fast bowler. Card 7 shows W.A.Oldfield, N.S.W., Wicket Keeper. Card 10 shows H. Verity, Yorkshire, L.H. bowler. Card 11 shows M. Leyland, Yorkshire, batsman. Card 14 shows H. Sutcliff, Yorkshire, batsman. Card 18 shows D.R. Jardine, Warwickshire, batsman, (Captain). Card 19 shows C.V. Grimmett, South Australia, bowler. Card 20 shows R.E.S. Wyatt, Warwickshire, all rounder. Card 21 shows W.H. Ponsford, Victoria, batsman. Card 22 shows S.J. McCabe, N.S.W., batsman. Card 25 shows K.S. Duleepsinhji, Sussex, batsman. Card 26 shows K.E. Rigg, Victoria, batsman. Card 27 shows H. Ironmonger, Victoria, bowler. Card 29 shows L.S. Darling, Victoria, batsman. Card 30 shows J.H. Fingleton, N.S.W., batsman. Card 32 shows H.S. Nitchske, South Australia, batsman. Card 35 shows Nawab of Pataudi, Worcestershire, batsman. Card 36 shows A.A. Jackson, Qld., batsman. Back of each card has information on the cricket player photographed and at bottom of reverse 'Issued with / B.D.V. / CIGARETTES / GODFREY PHILLIPS (AUST) PTY LTD./ MELBOURNE'. Issued with B.D.V. Cigarettes for Godfrey Phillips (Aust) Pty. Ltd., Melbourne. Purchased on Ebay in 2003.